Greetings again from the darkness. So many are haunted by the past – unable to move beyond either having been dealt a bad hand or having created one through their own actions. The film opens on a gaunt Steve (JK Simmons), alone in his apartment, and seemingly barely functioning. He is contemplating suicide with a shiny gun he keeps on a coffee table in a home as unkempt as himself. His only breaks are to frantically search the house for another bottle of vodka, or to listen to a phone message that kicks off yet another painful memory. The film features three timelines for Steve: the despondent, suicidal elder; the twenties and thirties version (Sebastian Stan); and the 1960’s childhood Stevie (Iain Armitage, “Young Sheldon”). Those young years for Stevie recall his always-annoyed mom (Mandy Moore) and his fun-loving dad (Max Greenfield), while the young adult years show us his romance and marriage with Karen (Maika Monroe). It’s not long before we recognize the common thread that binds the timelines: alcoholism. First his dad’s, then his own. Our memories tend to return in moments and flashes of events. This becomes more evident and the memories less reliable when years of alcohol abuse are in play. The flashes include the courtroom and judge of his parents’ divorce, his dad drinking, his own courting of Karen and the booze that accompanied it, the dissolution of his own marriage, and an unspeakable tragedy that ruined his life without taking it … something he is looking to remedy with that gun. JK Simmons is remarkable here. His Steve is mired in loneliness, depression, guilt, and regrets – each amplified through booze. Simmons’ performance offers up not a single line of dialogue. He never leaves the apartment. He never has human interaction. Yet despite all of this, he never leaves our thoughts as he pinballs through his memories. Mr. Stan and Ms. Monroe provide the most telling scene outside of Simmons’ segments. Notice the difference in demeanor as he tells her he heard the shot when his dad killed himself vs how she states her mother died from cancer. This is the contrast of moving on no matter what life serves up, or being burdened with that weight forever. The film was directed by Mr. Simmons’ wife Michelle Schumacher, and she co-wrote the screenplay with Tony Cummings (son of Emmy winning actor Robert Cummings). Mr. Cummings also appears as the judge in the divorce hearing. The film was originally shown in 2017, but is only now getting released. For fans of JK Simmons, it’s a must see. Greetings again from the darkness. “Don’t touch anything on the subway.” That should be a warning posted in all New York City tourist brochures. Recent NYC transplant Frances didn’t get the memo. She not only picks up a “lost” handbag, but also wants to personally return it to the rightful owner – despite the counseling of her streetwise roommate. Oscar winning director Neil Jordan (THE CRYING GAME) co-wrote the screenplay with Ray Wright, and they blend in many elements … not the least of which is making friends with someone you shouldn’t. Chloe Grace Moretz plays Frances as the good-hearted Boston-raised girl who is almost too innocent to believe, given the day and age we are in. When Frances returns the purse, she is greeted warmly and appreciatively by a kindly Greta (Isabelle Huppert). The two bond over their individual loneliness: Greta says her daughter lives abroad, and Frances’ mother passed away about a year ago. It’s easy to see how a friendship forms through a substitute mother-daughter gap-filling. An accidental discovery by Frances sends her out the door, intent on cutting ties with Greta. What Frances soon learns is that Greta is a crafty psychopath of the highest order. It’s at this point where filmmaker Jordan kicks in the twisted, dark humor and serves us a cheap-thrills ride via a full blown stalker movie. 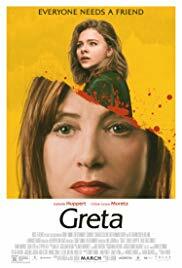 Greta is truly deranged and once Ms. Huppert cuts loose, we see how much fun she’s having. She even plays a piano teacher, which is kind of funny since she was also the piano teacher in THE PIANO TEACHER (2001). She becomes my first and favorite Liszt loving psychopath, who likely isn’t as technologically challenged as she makes out. There are stylistic and story elements reminiscent of movies like FATAL ATTRACTION and SINGLE WHITE FEMALE, and Jordan’s camera angles and lighting combine with Javier Navarrete’s score to dish up some B-movie type comically dark moments. Maika Monroe (IT FOLLOWS) is terrific as Frances’ roommate. She’s the direct type who tells Frances that “this city will eat you alive”, but is also extremely supportive and protective (and good at yoga). Stephen Rea and Colm Feore appear in limited roles, but the fun you have here is directly related to how you buy into the Greta vs Frances web. It’s rare to see an onscreen female predator, but neither Mr. Jordan nor Ms. Huppert round off any edges. We are reminded that being nice doesn’t always pay off, but having friends certainly does. There is some creepy evil fun to be had, as well as a key life lesson: never trust a woman with too many purses. Greetings again from the darkness. 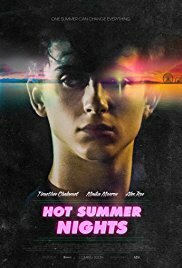 Crime, Romance and Bromance battle it out in the summer of 1991, accompanied by music from the 1970’s, influenced by classic films of the 1980’s and 90’s, and starring 4 rising young stars of today. The debut feature film from writer/director Elijah Bynum comes across as the work of a film and music fanboy concerned with not leaving out any ideas in his only opportunity to make a movie. He shows enough here to likely justify another chance, but we can’t help but wonder if assistance from a mentor might have fine-tuned this into a nice little gem, rather than a blip on the resume of the shooting stars he’s working with. Fresh off his Oscar nominated performance in CALL ME BY YOUR NAME, Timothee Chalamet stars as Daniel, a socially awkward 18 year old. After the death of his beloved father, Daniel’s mom ships him off for the summer to live with family in Cape Cod – yet another place where he will be an outsider as neither a ‘Townie’ nor ‘Summer Bird’ (the wealthy preppies in summer homes). An odd meet-cute kicks off the bromance between Daniel and local heartthrob/legend and dime-bag pot dealer Hunter Strawberry (Alex Roe, FOREVER MY GIRL). It’s also the beginning of a business relationship that both showers them with cash and puts them on the road to ruin. Hunter’s estranged sister McKayla is the local object of desire for the male population. Played by Maika Monroe (IT FOLLOWS), McKayla is the town vixen who ultimately and predictably falls for Daniel, unaware of his business dealings with her bad boy brother. Also in the mix here are Emory Cohen (so good in BROOKLYN) as Dex, the no-nonsense “supplier” who pushes the Hunter and Daniel dealings to greater heights, Thomas Jane as the local law enforcement presence, William Fichtner as the coke dealer Daniel tangles with, and Maia Mitchell as Hunter’s love interest. There is also the fallout from recently deceased parents for Daniel, Hunter and McKayla, as well as the impending storm (now known as Hurricane Bob). An air of familiarity is not uncommon in movies, but this one is downright creepy in how many films it seems to mimic in either tone, style or content. The romance between Daniel and McKayla is the least effective story line. 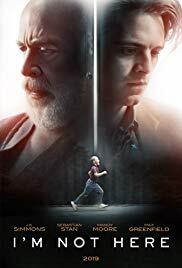 We want to know more about the brother-sister relationship, and are disappointed that the uber-talented Maika Monroe is given little to do other than bat her wicked eyes. It plays like a Greek tragedy where the only question is whether the tropical storm will beat the group’s self-destruction. This summer story is billed as ‘coming of age’, but that description doesn’t seem to fit unless it refers to the ever-present young narrator whose place in line only becomes clear near the end. There is a nostalgic look and feel to Mr. Bynum’s film, and it’s always nice to have a drive-in theatre play a role; however, his music choices – though terrific to listen to – seem to fit better two decades prior to the setting: Mott the Hoople’s “All the Young Dudes”, David Bowie’s “Space Oddity”, Uriah Heep, Linda Ronstadt and The Modern Lovers. Beyond all of that, we do learn that Hunter Strawberry does not like sprinkles. Greetings again from the darkness. Since there is always “trouble in paradise”, perhaps living in paradise shouldn’t even be a life goal. There are certainly less expensive ways to enjoy a nice view than relocating the family from the frozen Midwestern leisure of Michigan to the ultra-rich, keeping-up-with-the-Joneses hypocrisy of Palos Verdes. Joy Nicholson’s 1997 book has been adapted for the screen by writer Karen Croner. Brothers Brendan Malloy and Emmett Malloy co-direct in what appears to be their feature film debut after 15 plus years of music-related videos, shorts and documentaries. The Masons move into a cliff-side mansion in Palos Verdes. The breathtaking Pacific Ocean view is supposed to offset the homogenized exclusive suburbia punctuated with manicured lawns, freshly painted homes, and close-minded wealthy folks. That works for Phil (Justin Kirk), the cardiologist who does see this as paradise and hopes his family will feel the same. His wife Sandy (Jennifer Garner) is struggling with depression, and their twin 16 year old kids Medina (Maika Monroe) and Jim (Cody Fern) are personality opposites … he being the popular kid, while she is a loner. Since we all know new curtains don’t fix a broken window, the fractured family is soon on full display. The dysfunction came along as part of their relocation and much of this can be traced to Sandy’s manic-depressive state. The stress-related fallout is ugly. Phil finds comfort in the arms of their Realtor (Alicia Silverstone), who scores a doctor to go along with her commission. This sends Sandy spiraling down the rabbit hole, as Jim starts experimenting with drugs, and Medina seeks peace on a surfboard that she procured through a most unusual negotiation. Most of the story is told from Medina’s perspective, and Ms. Monroe excels. Her breakout role was a couple of years ago in IT FOLLOWS, and though she’s a bit too old to play a 16 year old, she is so talented and relatable that to whatever extent the movie works for you, it’s likely to be because of her. The way she handles the cold distance between she and her mother is heartbreaking, yet her sadness and frustration at being the only one recognizing the fall of brother Jim is truly devastating. The ultra-angst is sometimes a bit too heavy, as is the over-use of slow-motion and the overbearing indie music (as you might expect from music video directors). Many will hail Jennifer Garner’s performance since it is so far removed from her usual grinning and lovable type, but I found her a bit too extreme and trying too hard. Despite these issues, the mystic draw of the sea makes perfect sense as Medina literally surfs the choppy waves of life. A threat of disaster is always on the cusp, and the filmmakers take full advantage of the contrasting beautiful setting. Finding our tribe is a key to life and we are privileged to follow along with rising star Maika Monroe’s fabulous performance. The Dallas International Film Festival is a great place to catch up with those hard to find short films. It’s not unusual for short films to be later developed into feature films, but regardless, the short film format requires a unique skill set for writers, directors and actors. A connection must be made immediately with the viewer because there is no time for gradual acceptance or interest. Short films come in three flavors: live action, animated, and documentary. Below is a recap of the six documentary short films at this year’s DIFF. Directed by Andrew Rodgers. Kinder eggs are illegal in the United States as they are considered a choking hazard for kids. However, this collector has hundreds of the miniature figures/toys thanks to decades of pursuing the eggs through his global travels. Directed by Topaz Adizes. A couple face off against each other with some extremely personal questions. In a matter of minutes, the audience is as uncomfortable listening as the participants are in revealing very private thoughts. Directed by Adam Ruffman, Luke Poling. The story of Gene Morris who successfully fought to get spearhunting approved as an acceptable form of hunting in Alabama. Guns and bows lacked the challenge that Morris desired. We even visit his legacy – a Spearhunting museum that houses some of the trophies from his 592 kills. His ex-wife labels the late Mr. Morris a serial animal killer. Directed by Scott Edwards. Master Hoa was one of the hundreds of thousands who fled South Vietnam by boat in 1975. In the process, he lost his family. We see how he re-established a new life, and we go with him on a heart-breaking search for the graves of his family. Directed by Natasha Reheja. Have you ever noticed that the manhole covers in NYC are stamped “Made in India”? Ms. Reheja noticed and thus began her journey to foundry where the bronze plates are crafted. It turns out these are highly skilled workers who take great pride in their work, face labor union issues, and sacrifice their hands, feet and backs for the manually intensive manufacturing process. Directed by Kitty Green. We see a stream of auditions from girls of various ages wanting the highly coveted role of the Ukrainian legendary figure skater Oksana Baiul – former World Champion and Olympic Gold Medalist. That’s it for the documentary shorts. Below are the three features I watched in addition to the previous doc shorts. Greetings again from the darkness. The fallout from war goes beyond the violence and massive loss of life. Returning soldiers often struggle to regain a sense of normalcy, and are often labeled as PTSD: Post Traumatic Stress Disorder. And what of the families … those left behind with a gaping hole in their heart from the loss of a loved one, and those having to adjust to the “affected” surviving soldiers? This is the heart-breaking story of two families at the convergence of all of the above. 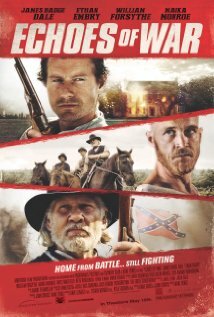 With the Civil War ending, Wade (James Badge Dale, “The Pacific”) returns home in search of “peace”. He shows up at the house of his brother-in-law Seamus (Ethan Embrey) and is greeted with open arms by his niece Abigail (Maika Monroe, It Follows) and nephew Samuel (Owen Teague), who clearly worship him as their favorite Uncle. Though it’s not a Hatfield and McCoys extreme, it doesn’t take long for Wade to figure out the awkward and mostly silent unbalanced relationship between Seamus’ family and the McCluskey neighbors. Randolph McCluskey (William Forsythe) is a bitter man who lost a son in the war, has an unresponsive wife (Beth Broderick) due to that loss, and two sons: Dillard (Ryan O’Nan) who is a bit slow-witted, and Marcus (Rhys Wakefield) who is far too sensitive to be accepted by his crusty old father. Wade’s best intentions of protecting his family turn a barely tolerable arrangement into an all-out war. On top of that, we get a bit of Romeo and Juliet to go along with Wade’s slow-drip meltdown as he is simply unable to handle what the war has made him. The connection between Abigail and Marcus is exciting to watch, though we all recognize a romance facing a heavily stacked deck. Wakefield was previously seen in The Purge, and Ms. Monroe was stunning in It Follows. Both are young actors to keep an eye on. It’s almost unbelievable to accept that this is the first feature film from director Kane Senes and his co-writer John Chriss. There is so much going on here with multiple layers of conflict and personalities … plus the movie is beautifully shot with an air of artistic flair that lightens a mood when necessary, or makes an analogy of nature and man either through plants, critters or the sky. Religious overtures play a role, and it’s fascinating to watch the various interactions … each more complex than the previous, culminating with Wade and Seamus who seemingly couldn’t be more different. The film explores the comparison of bravery versus cowardice and it challenges our beliefs. There is also a theme of survival – just what makes a life worth living? The acting here is something to behold. All eight are exceptional and contribute to the film’s ultra-serious approach, broken by brief moments of pure joy. With a terrific and complex story, stellar acting, and a talented director, this is one that serious film goers should seek out and embrace. Greetings again from the darkness. Dallas loves Dirk. 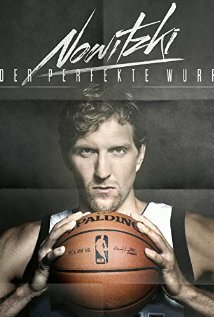 The reasons why become obvious during this biopic that takes us from Dirk’s youth basketball league in Germany through his NBA Finals, while including significantly more information on his family and personal life than we have previously seen. Interviews come courtesy of such well known faces as Kobe Bryant, Don Nelson, Michael Finley, Mark Cuban, Yao Ming, Jason Kidd and former NBA commissioner David Stern. Contrary to many sports documentaries, this is no shrine to its subject. Of course, we can’t help but be charmed by the “great guy” superstar, but it’s through his life challenges that we come to truly respect Dirk as a man. Director Sebastian Denhardt is one of the most prolific documentarians and filmmakers in Germany, but this look at Germany’s most popular and successful athlete is his best and most accessible work to date. The most interesting segments involve Dirk’s long time personal coach Holger Geschwindner, plus insight from Dirk’s father, mother, sister, and childhood friend. It’s during these times that we realize Dirk’s “posse” is made of the people who he has always trusted – family and friends. The only two newcomers to his group of “insiders” are Lisa Tyner and Dirk’s wife Jessica. Ms. Tyner is the Mavericks staffer who took Dirk under her wing when he was a youngster transitioning to life in the United States. While the film drills home the importance of Dirk’s work ethic and commitment to excellence, the most entertaining moments include: Dirk’s first meeting with Steve Nash, Dirk as a stick figure on Holger’s software, Dirk in a tennis skirt (for Halloween), Dirk dominating on the court as a teenager, Dirk’s mother discussing his move to the U.S., and best of all, Dirk stretching the truth a bit while meeting with former German Chancellor Helmut Schmidt … and then admitting it! These days, disappointment seems to be the most common reaction when the curtain gets pulled back on celebrities and heroes. It’s refreshing to look into the life and see that the biggest scandals were when Dirk was the one cheated by a former girlfriend, and he stood by in full support of a friend going through an investigation for tax evasion. Dirk shows he is as impressive as a human being as he is a basketball player. What he definitely isn’t? A singer … we re-live his “We are the Champions” rendition from the parade. Dirk rocks! Greetings again from the darkness. D’Drum. Stewart Copeland. Gamelan. Most viewers might be familiar with one of these – Stewart Copeland is the world famous Rock drummer and co-founder (with Sting) of The Police. 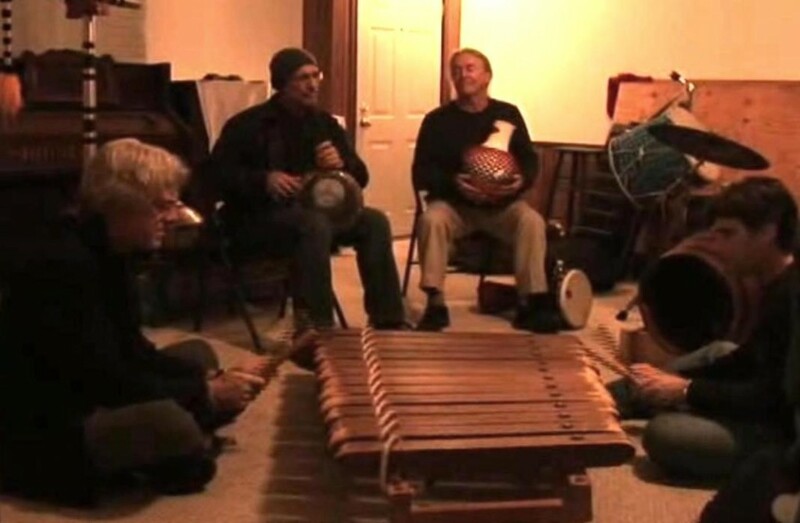 D’Drum is a Dallas area based ensemble of percussionists who have been playing together for two decades. Gamelan is the traditional percussion based music so important to Java and Bali in Indonesia. If you are curious how these three pieces might fit together, let’s make it more challenging and unlikely by blending in world class conductor Maestro Jaap Van Zweden and the Dallas Symphony Orchestra. Yes, this really happened and the result was a show-stopping 2011 performance of “Gamelan D’Drum”, a symphony composed by Copeland, conducted by the Maestro, and performed by the D’Drum fellows and the musicians of the Dallas Symphony Orchestra. John Bryant is one of the drumming members of D’Drum, and in very impressive fashion, he also directed, edited and produced the film. He perfectly captures the process of these passionate musicians (insert drummer joke here) and their never-ending quest for new percussion instruments, no matter the part of the world. Their multi-cultural approach led to a stage filled with dozens of instruments, including those custom-made for the performance. Inspirational seems to fall short in describing what unfolds on screen. Mr. Copeland’s enthusiasm towards the project was obvious in the post-screening Q&A as he energetically answered any question even remotely directed his way. See, he is what one would call a courageous musician – one not intimidated by the traditions of the world of symphonies and orchestras. He understands that the foundation of art is creating something new, and he brilliantly manages this without losing the audience. While Copeland’s creativity and D’Drums eagerness are commendable and a joy to watch, none of this happens without the (risky) support of Maestro Jaap Van Zweden. So many conductors are tied to the traditions, and hesitant at best, to take risks with music that has been played the same basic way for sometimes hundreds of years. Instead, his positive attitude and willingness to push boundaries delivered one of the most exciting evenings ever for the Dallas Symphony Orchestra … not to mention Stewart Copeland and the members of D’Drum. Should you have the opportunity to see this one, take it. And afterwards … “Do it again, man”! Greetings again from the darkness. Known for an endless stream of copycats and re-treads, the horror genre periodically surprises us with a dose of originality. Heck, we don’t even ask horror filmmakers for anything too revolutionary … just give us something we haven’t seen a few dozen times before. Writer/director David Robert Mitchell “gets it” and delivers a game of psycho-sexual-tag-you’re-it featuring the most sinister STD ever. A definite departure from the all-too-common teen slasher films, the slow-drip terror of this one has more in common with dread and eventuality than scream-inducing terror and “made you jump” scares. When we first meet Jay (Maika Monroe), she is a typical pushing-twenty student who enjoys leisurely swims in her suburban backyard pool, hanging out with friends, and a healthy dating scene. Well, healthy until one evening of back seat passion with Hugh (Jake Weary) sets off the above-mentioned sinistry. See Jake has purposefully “passed on” some kind of affliction that attracts a death-seeking entity who slowly, but purposefully pursues its target. Supposedly the only options are to be killed or pass it on through more passion … the worst kind of “pay it forward”. Jay is supported in her ongoing attempts to avoid the entity by her sister Kelly (Lili Sepe), her neighbor and classmate Greg (Daniel Zovatto), and Paul (Keir Gilchrist) her not-so-secret admirer who would do anything to protect her. The big catch is that only Jay can see the entity … making heroism quite elusive for her support group. 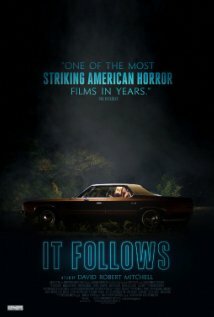 Lest there be any doubt of the dire situation, director Mitchell begins the movie with a very vivid example of the likely result in being “caught” by the entity, and adds the score from composer Disasterpeace … an ominous throwback techno-sound that would be distracting if not so fitting. This has all the makings of a breakout role for Maika Monroe, with similarities to Jamie Lee Curtis in the original Halloween movie (1978). The low budget caused some obvious production limitations – in particular an awkward bounce from day to night and back again, and some iffy effects. However, the suburban Detroit setting provides a nice backdrop, and of special note are the Redford Theatre (est 1928) replete with its beautiful pipe organ, and the indoor swimming pool put to spectacular use in the film’s climax. As long as the audience is not expecting the typical teen slasher, this creative horror film should gain an audience while putting director David Robert Mitchell on the fast track to bigger budget films.